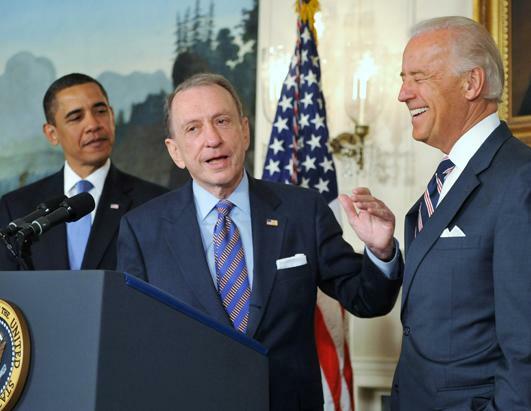 Barack Obama and Joe Biden attend a press conference welcoming Arlen Specter to the Democratic Party at the White House April 29, 2009. Photo: Ron Sachs-Pool/Getty Images. Sen. Arlen Specter and Gov. Ed Rendell during Specter campaign rally in Philadelphia, May 15, 2010. Photo: AP. Sen. Arlen Specter was carried in a flag-bedecked limousine from Temple Har Zion to his eternal resting place at his family’s plot in Shalom Memorial Park. Photo: Daniel Loeb. Har Zion Temple was the site of the funeral for Senator Arlen Specter, and the thousands of people who poured into the main sanctuary, which had to be opened up to include the ballroom behind it, represented a cross-section of America. Judges and lawyers and U.S. Attorneys and academics and heads of charities and former Specter staffers by the score populated the seats at Specter’s funeral. Candidates and former candidates from both sides of the aisle came to pay tribute to a mover and shaker who according to every speaker, did the right thing, the fair thing, even when voting for President Obama’s stimulus package would cost him his seat in the Senate. Specter’s influence crossed political boundaries, racial differences, and economic backgrounds, as evidenced by the huge diversity of those in attendance to pay their respects to Joan Specter and her family. Federal officials, past and present, like Senator Bob Casey, former Senators Ted Kauffman and Harris Wofford, and former Congresswoman Marjorie Margolies; state officers, including Governor Tom Corbett; federal and state judges; leaders of academia; and hundreds and hundreds of other notables, like Gwen Goodman, former executive director of the National Museum of American Jewish History, and Lee Ducat, founder of the Juvenile Diabetes Foundation. Ducat nodded as each speaker mentioned Specter’s passionate defense of funding for cancer research and stem cell research, even when various Presidents decided to cut funidng of the National Institutes of Health. Chief among the notables, however, was Vice President Joe Biden, who teared up as he spoke about Arlen Specter, his dear friend, who always was there for him, especially in times of personal crisis. Biden and Specter seved in the U.S. Senate, and Biden said in his remarks that he knew he had spent more time with Specter than anyone else in the sanctuary, sitting with him in the Senate and especially in the Judiciary Committee meetings and hearings. Biden also let people know that he had foregone campaign stops in two critical swing states, Colorado and Nevada, to pay tribute to his dear friend at Har Zion Temple. President Obama that very morning had ordered all American flags to be flown at half-staff on all government properties, military bases, embassies, etc., in the nation and around the world, to salute Senator Arlen Specter on the day of his funeral. But the people asked to speak by Joan Specter were close personal friends, like Biden. Like Ed Rendell. Like Flora Becker, widow of Judge Ed Becker. Like Judge Jan DuBois. Like Steve Harmelin, Esq. Like Shanin Specter’s long-time law partner, Tom Kline. Like Shanin Specter, the Senator’s son, and two of Arlen’s four grand-daughters. Perhaps most remarkable, in all of their praise of Specter’s fairness and acumen, was the telling of how, less than two weeks before his demise, Specter insisted on teaching his class on the Constitution at Penn Law School. I guess that was why Penn President Amy Gutmann was also in attendance. 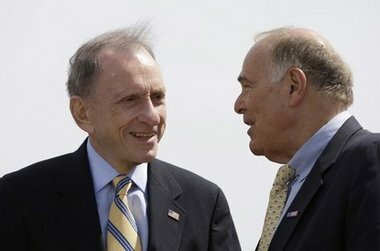 Probably half the people in the throng owed their careers to Arlen Specter, either through having been hired by him when he was either District Attorney, or having been appointed by him when he chaired the Judiciary committee. Although each of the speakers, including life-long friends Flora Becker, Judge Jan DuBois, attorney Steve Harmelin, Governor Ed Rendell, Specter’s son Shanin, and Vice President Biden shared wonderful anecdotes and memories of Specter, going back to Penn undergraduate and Yale Law School days, it was two of Specter’s granddaughters who made the greatest impact. Sylvie Specter, by the way, is a friend and classmate at Penn of Biden’s own granddaughter. Sylvie and Perri Specter told us that their grandfather had spent two weeks before his passing, working on yet another book – one that was a memoir with photographs from his amazing collection. They announced that the family plans to complete the book and have it published, joining the array of Senator Specter’s other remarkable books. Rabbi Kieffer, Rabbi Knopf and Cantor Vogel of Har Zion contributed to the testimonials, making this a remarkable send-off for a remarkable man. Rabbi Steven Fox, Chief Executive of the Central Conference of American Rabbis; Rabbi Ellen Weinberg Dreyfus, President of the Central Conference of American Rabbis; and Rabbi David Saperstein, Director of the Religious Action Center of Reform Judaism today released a letter urging Senate Majority Leader Harry Reid (D-NV) and Senate Minority Leader Mitch McConnell (R-KY) to enact sensible filibuster reform when the Senate convenes for a new Session on tomorrow. On behalf of the 1,800 rabbis of the Central Conference of American Rabbis, the national Reform rabbinical association, we write to advocate sensible filibuster reforms. During the 111th Congress, a challenge to the smooth functioning of democracy, which had been growing evident for some time, came into stark relief. 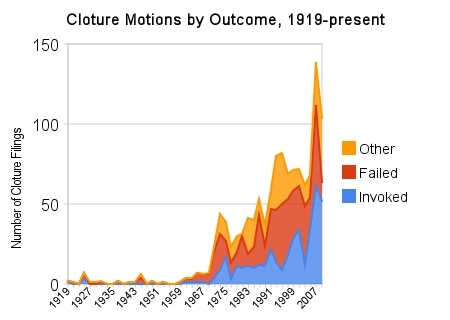 A minority of Senators invoked cloture 63 times-the most of any other Congress, indeed, more than the sum total of instances between the creation of the modern filibuster at the beginning of the 20th century and 1982. Rather than facilitate a cautious and deliberate legislative process, the filibuster in its current incarnation has created gridlock and has weakened the government’s ability to respond to the needs of its citizens. In a Dec. 18 letter, 56 Democratic Senators called on you to take steps to curb this abuse of the filibuster. We are encouraged as well that a respected returning Republican Senator, Dan Coats, has also called for reform. We ask you to heed their call, and work together. Reform cannot succeed without bipartisan support. Let us be clear: the filibuster is a vital and necessary tool of the minority. The Central Conference of American Rabbis (CCAR) has consistently opposed attempts to eliminate the right of a minority of Senators to block extreme legislation and nominees. The CCAR has also supported efforts to reduce misuse of the procedural tactic when it occurs. During the 1950s and 1960s, a minority of legislators used the filibuster to prevent civil rights legislation from receiving a vote before the U.S. Senate. For this reason, the CCAR supported successful reform of Senate rules in 1975 to lower the threshold for cloture from a two-thirds to a three-fifths majority. During the 111th Congress, the filibuster denied the DREAM Act an up or down vote in the Senate. The chamber never even debated legislation addressing climate change because of the mere threat of the filibuster. While many factors were at play, the filibuster or threat thereof diminished the Senate’s ability to respond to the needs of unemployed Americans struggling amid a prolonged jobs crisis, led to a health care reform law with fewer cost control mechanisms, and produced Wall Street reform with less ability to address the root causes of the financial meltdown. Dozens of other important issues never came before Congress over the past two years because filibusters consumed so much of the Senate calendar. When the Senate rules create a status quo where justice is so frequently deferred or denied, the people start to lose faith in our democratic institutions, apathy is engendered, and the health of our democracy is threatened. Continuous debate-a substantial number of senators should be required to sign a petition in order to initiate a filibuster and members should be forced to speak continuously in order to sustain it. The onus should also be on the minority to maintain a filibuster rather than just on the majority to break it. Eliminating anonymous holds-the filibuster was designed to allow a minority to slow down the legislative process in order to make its case to the public. Anonymous holds accomplish only gridlock, allowing the minority to conceal itself behind a cloak of procedure without justifying its obstruction. Fewer opportunities to filibuster-the minority currently has the ability to filibuster the initial motion to debate legislation, amendments, and the final vote. Duplicative filibusters clog the Senate calendar and prevent the legislative branch from doing the people’s work. The minority should get one opportunity to block a piece of legislation through procedural tactics. Strengthen the right of the minority to offer amendments-supporters of the filibuster argue that it is a necessary tactic when the majority offers insufficient opportunities to offer amendments. But, currently, more amendments offer more opportunities for filibuster. Allowing each side to offer amendments with a limited amount of time for debating each would circumvent this problem and provide more opportunities for minority input. We urge you to consider these and other ideas to limit abuse of the filibuster. The cause of social justice depends on a legislative branch that is responsive to the will of the people while mindful of minority rights. If you have any questions, please do not hesitate to contact us at 202-387-2800.